The Vegetable Production Systems lab, in partnership with the University of Tennessee Institute of Agriculture and with the cooperation of the Ohio Ecological Food and Farm Association and Tennessee Organic Growers Association, is currently studying the impact of microbial biostimulants on crop productivity and profitability. Experiments are currently underway at the Ohio State University’s Agricultural Experiment Station in Wooster, OH and on farms across the north central region of the United States where grower collaborators are completing on-farm research and evaluation. To be considered for this opportunity in the future, please contact us. For more details about what it means to be a grower collaborator see our FAQ document. Specifically, we are studying biostimulants that contain microbes (i.e. bacteria and/or fungi) as their active ingredients and are advertised to enhance crop growth and resistance to biotic and abiotic stresses. This excludes products advertised as biopesticides (“types of pesticides derived from such natural materials as animals, plants, bacteria, and certain minerals” as defined by the EPA), and biostimulants whose main ingredients are substances other than bacteria or fungi (such as humic acids, protein hydrolysates, seaweed, for example). Our focus is on those products which are OMRI-listed and applied by sustainable and organic growers to vegetable crops. Read on for details about these products, this project, and the important role on-farm research and evaluation plays in answering questions about how to measure their efficacy. 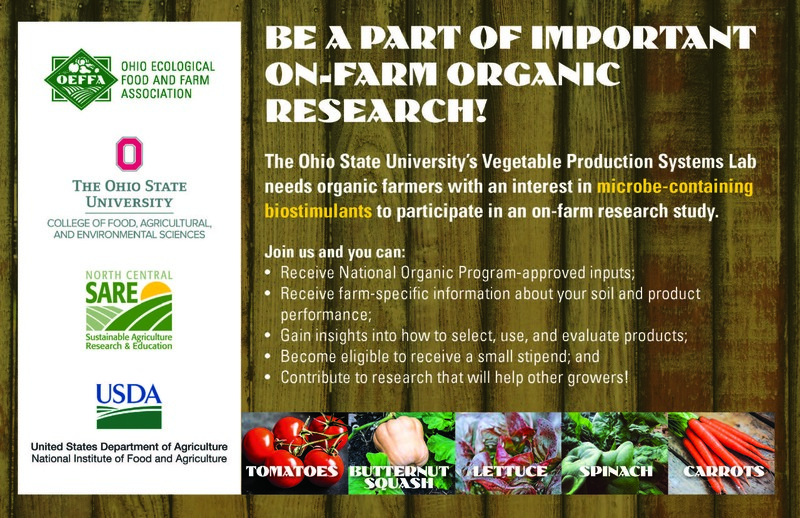 Grower collaborators receive National Organic Program-approved inputs; farm-specific information about soil and product performance; insights into how to select, use, and evaluate products; and become eligible to receive a small stipend. Collaborators’ contribution of time and effort contribute to research that helps other growers! Interested in learning more about these products? Join our listserv, search our database that compiles OMRI-listed, microbe-containing biostimulants, and listen to an archived series of recent call-in conversations about selecting, using, and evaluating these products. 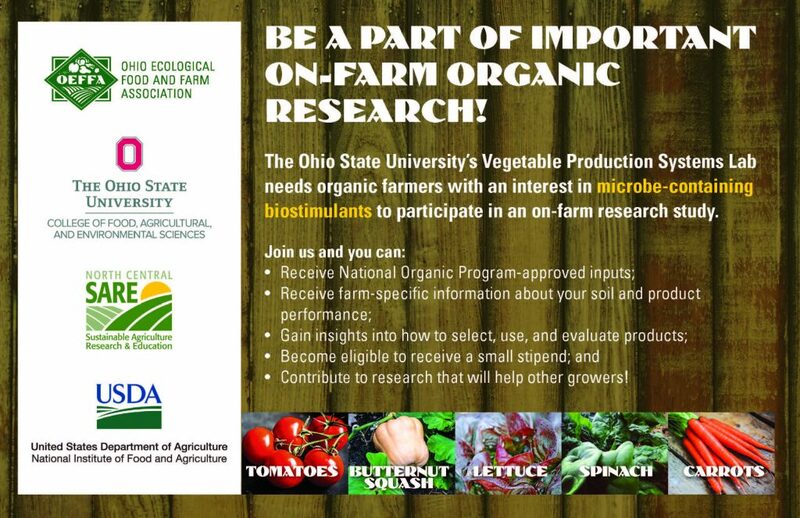 Details about our experiments on the OSU’s Agricultural Experiment Station in Wooster, OH can be found on our partner website, the Organic Farming Research Network. This excludes products advertised as biopesticides (“types of pesticides derived from such natural materials as animals, plants, bacteria, and certain minerals” as defined by the EPA), and biostimulant/biofertilizers whose main ingredients are substances other than bacteria or fungi (such as humic acids, protein hydrolysates, seaweed, for example). Vegetable growers look to enhance and maintain the vigor of their crops and health of their soils. Some growers apply certain bacteria and/or fungi in the form of commercial or home-made inoculants to assist in the process. Establishing specific microbe-to-plant interactions with these applications is sometimes credited with increasing the reach, activity, and effectiveness of plant root systems, enhancing access to nutrients and water and the production of phytohormones. Inoculated crops can also show greater stress tolerance and some microbes can enhance soil nutrient availability. Still, of the many thousands of different types of microbes that can inhabit agricultural soils, a small percentage has been tested and found to have the potential to help growers. An even smaller percentage is included in commercial microbe-containing biostimulants/biofertilizers advertised to enhance crop growth, especially in organic vegetable production. Grower and researcher experiences with these commercial products have been mixed. Product applications typically have positive to neutral effects on crop growth and yield, although decreased yields have been reported in rare cases. Growers, product manufacturers, researchers, and others offer various explanations for the mixed, inconsistent, and sometimes weakly positive results. Some suggest that the product was stored, handled, or used incorrectly. Others suggest that the product was inherently defective (e.g., contains too few, inactive, or the ‘wrong’ type of microbe). Others doubt that any inoculant is likely to result in significant growth and/or yield increases, given the complexity and quick-changing nature of soil, microbe, and crop interactions and environments. Regardless, two things appear to be true: microbe-containing biostimulant/biofertilizer production and use continue to climb in the U.S. and world and growers have many questions about selecting, using, and evaluating the effects of them. Questions about selecting, using, and evaluating the effects of microbe-containing biostimulants/biofertilizers are expected. These products are regulated differently than biopesticides, difficult to assess cost-benefits of, often minimally labeled, very numerous and diverse, and generally not discussed in extension and similar objective resources. Growers wonder how to use them most effectively. Establishing, sharing, and helping stakeholders implement core components of user-centered guidelines for the best practical use of these in sustainable and organic vegetable production. We are taking several steps to address grower questions about microbe-containing biostimulants/biofertilizers. First, we created and maintain an interactive database of OMRI-listed products. The database is updated periodically and now contains information on more than 200 products. Second, we partner with vegetable growers, product manufacturers, and others in evaluating products and assisting people in completing their own evaluations. Currently, there are several projects underway on-station at the OARDC in Wooster, OH as well as on-farm at locations throughout the Midwest. 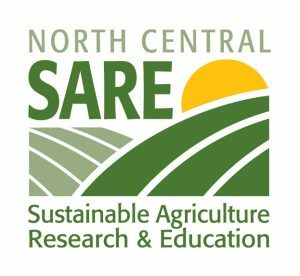 Projects are supported by USDA-NIFA Organic Transitions and NCR-SARE. Past projects have been supported by the Paul C. and Edna H. Warner Endowment Fund for Sustainable Agriculture, the OSU-Center for Applied Plant Sciences (CAPS), and the OSU Department of Horticulture and Crop Science. The Ohio Ecological Food and Farm Association (OEFFA) and product manufacturers have also assisted with the projects. Finally, we also share the results from work involving with microbe-containing biostimulants/biofertilizers widely and in many formats, including conferences, articles, workshops, and personal consultations, many of which you can find by further exploring this website. This work is supported by the Organic Transitions Program grant no. 2016-51106-25714 from the USDA National Institute of Food and Agriculture. This material is based upon work that is supported by the National Institute of Food and Agriculture, U.S. Department of Agriculture, under award number 2016-38640-25381 through the North Central Region SARE program under project number LNC16-380. USDA is an equal opportunity employer and service provider. Any opinions, findings, conclusions, or recommendations expressed in this publication are those of the author(s) and do not necessarily reflect the view of the U.S. Department of Agriculture.